Learn how to defend yourself and get in the best shape of your life! Beginning something new should be easy. All adult jiu jitsu students receive an orientation lesson as part of their free trial. 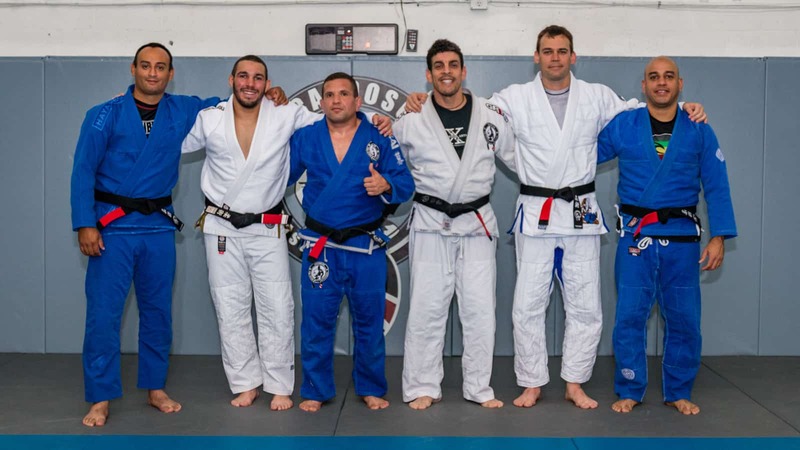 This is a personalized orientation designed to maximize your jiu jitsu experience and make the transition into the sport stress-free, safe, and engaging. For those new to Brazilian Jiu Jitsu, it will help you more quickly grasp some of the drills and movements that form the foundation of the sport. Regardless of your age, fitness level, or experience in the sport, our orientation process will put you on a path to maximize your development. Our curriculum includes classes where you practice in the gi (uniform) and classes without it (called “nogi” or “submission grappling”). Come get started today and see why we have the best Brazilian Jiu Jitsu (bjj) in Miami metro. Brazilian Jiu Jitsu is the fastest growing martial art in the world. It is a sport, self-defense system, and a fitness program. It has proven to be the most practical and effective self-defense system in the world. It relies on leverage and technique, rather than strength and size so you can defend yourself against much bigger, stronger attackers. As a result, BJJ is a great sport for everyone – including women and kids. BJJ focuses on grappling and ground fighting with the goal of getting into a position to force an attacker or opponent to submit or give up. It is also an intense aerobic and anaerobic workout so your overall health and fitness will improve, including your flexibility, strength, cardiovascular fitness, ability to burn fat, and muscular endurance. Joe Rogan (BJJ Black belt, UFC commentator, podcaster, & comedian) says “Brazilian jiu jitsu is a vehicle for developing your whole life.” Check out the videos below to see him, Sam Harris and other celebrities (explicit language warning) talking about jiu jitsu – along with some great training and competition footage. Brazilian Jiu Jitsu originated in feudal Japan for samurai to use when they lost their sword. Its objective was to get an armor-clad opponent on the ground in order to kill him with a knife. After war subsided, it became less useful and a variety of styles emerged. ​In the late 1800s, Jagoro Kano consolidated the styles prioritizing practicality and efficiency. He renamed the art Judo. A Kano’s student, Count Maeda, immigrated to Brazil and began teaching judo. Two students, Carlos and Helio Gracie, excelled and further expanded the art with an increased emphasis on street fighting and self defense. What emerged is called Brazilian Jiu Jitsu (BJJ). Helio’s eldest son, Rorion Gracie, moved to the US in 1978 and formed the Ultimate Fighting Championship (UFC) to showcase BJJ’s effectiveness. Royce Gracie dominated the early UFCs despite having a size and athleticism disadvantage. This accelerated the expansion of the sport, and BJJ has become an essential skill in Mixed Martial Arts. Many people start jiu jitsu to learn self defense or get in shape, but they quickly learn that it is an addictive sport that can have a profound effect on many aspects of your life.